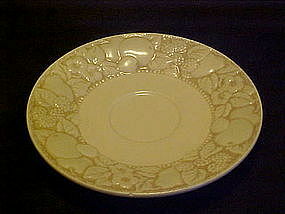 Single saucer in the antiqua pattern made by Metlox, poppytrail, Vernonware of California. Soft creamy oatmeal color with antiqued effect showing off the relief of fruit and berries bordering. I actually have 3 available and all are perfect. Price is for 1 saucer.